Monster Jam: Crush It! 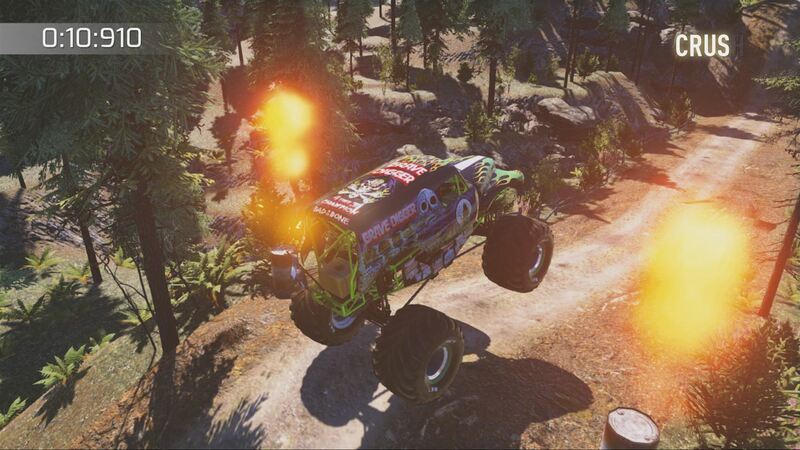 is a monster truck game that brings racing, stunts and uphill climbing to your fingertips. There are three categories: race, freestyle and uphill with uphill having three categories of its own: survival, time attack and stunt. With over ten different stages and trucks Monster Jam: Crush It! seems deep at first look, but it doesn’t take very long to realize that appearances can be deceiving. 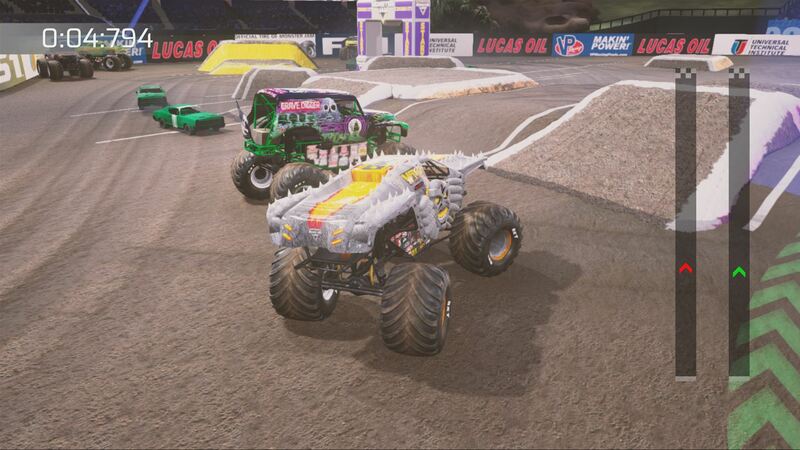 After less than thirty minutes with Monster Jam: Crush It! I already knew the dredge it would be to get through this game. A decent rock soundtrack plays in the background, but even that isn’t the best when you start hearing the same song for the 100th time. Truck design — There are 24 trucks total in the game, a few of them being different versions of themselves. The classics you know and love like Grave Digger, Blue Thunder and El Toro Loco are here, joined by newer favorites like New Earth Authority (N.E.A. Police) and Zombie. Each truck looks exactly like their real life counterpart, from the tires to the roof. Music — Monster trucks just scream heavy metal when I look at them. I couldn’t imagine driving or watching monster trucks with pop, rap or techno behind it as that just seems like blasphemy. 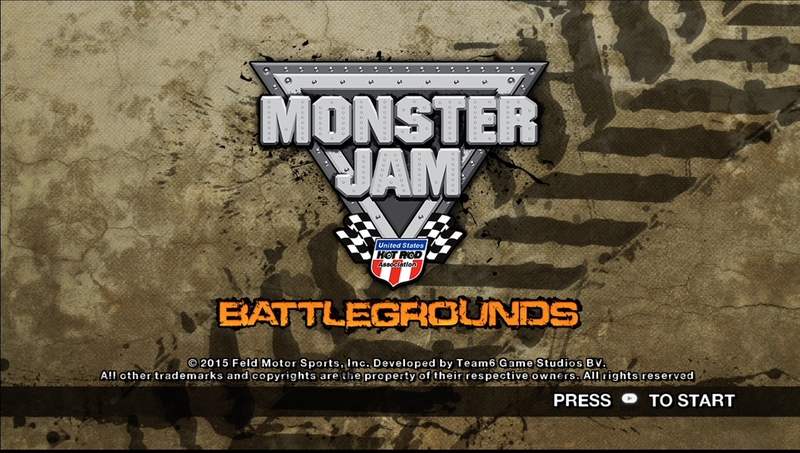 It felt good running over cars and hitting huge jumps while rocking out to this heavy metal fast paced soundtrack. Diversity in trucks — As I mentioned before, they do offer multiple trucks to pick from that look aesthetically pleasing, but that is the only difference in all of these trucks. Each one drives the same. This is just boring and bland, I in no way believe that Grave Digger a massive SUV controls the same way as Blue Thunder, which is an open bed pick up truck that is smaller and lighter. In real life each one of the trucks has different engines, chassis’, struts, shocks. They are all fine tuned as well, explicitly set up for the weight and size of the vehicle and the driver’s preferences. That means that some trucks are bouncier than others, some have a higher acceleration or tighter turning, yet we get none of that. It is 100% the same truck with a different skin slapped on it. Control — I don’t expect Forza style control on the ground when diving these things. I am completely okay with them being loose and slightly wild when racing around. The biggest indignity here is the aerial controls. These are necessary to win in stunt modes and during the hill climbs. The controls never felt good or responsive, no matter how many courses I ran through. The same stunt takes a different amount of time each time you do it, so there is no way even to judge if you have time to do more than one stunt. Sometimes you should have enough time to do at least two flips or rolls, yet the truck barely manages to complete one. There is absolutely no rhyme or reason for this and becomes very frustrating rather quickly. Stage design — Despite the fact there are “96 different levels”, it still feels like the same track over and over. Races are pointless, they take 12 seconds and you never have to let go of the gas. The stunt levels are poorly designed and almost impossible to get a good score off of as you’re better off using the wall to throw your truck in the air rather than using any of the ramps. 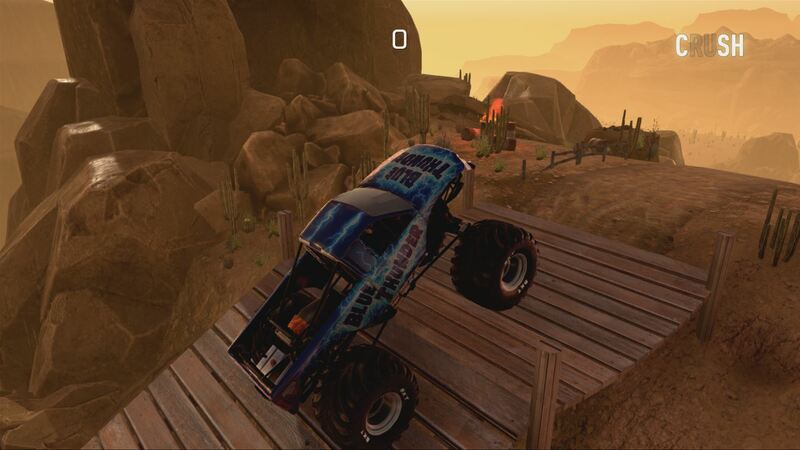 Hillclimb is more of a Trials style level design, that you have to traverse to the end of. They offer four different environments and three different styles, but they all just blend together and feel mostly the same, only ever being challenging because of the controls mentioned above. Monster Jam: Crush It! is fun for about five minutes and that’s only if you skip the stunts and go straight to the hill climb mode. I already mentioned that it is repetitive and rather dull, but I haven’t mentioned the framerate yet. 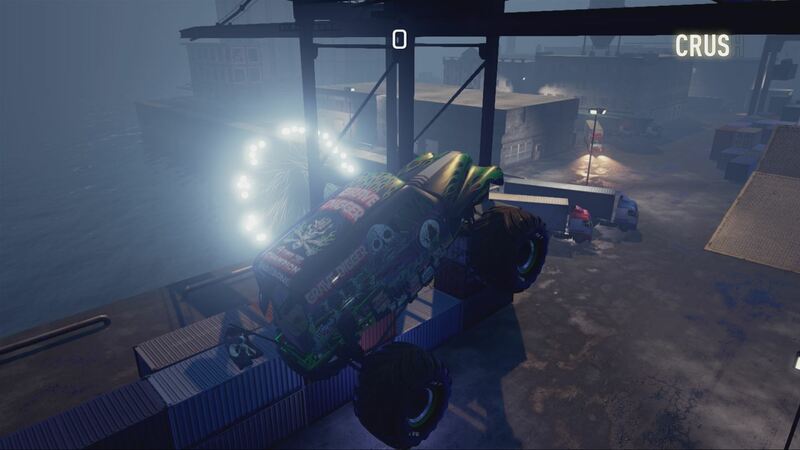 This is an era where games are being judged for not being able to run at 60fps and here we have Monster Jam: Crush It!, which with nothing but a still background and one airborne truck struggles to keep the frame rate at a stable level. The only upside to this game is if you are into achievements as the full 1000g can be obtained in under 5 hours. Unless you’re a huge monster truck fan and collector or love easy gamerscore like me, you would be better off spending your money elsewhere. Monster Jam: Crush It! was developed by Team 6 and published by GameMill Entertainment. It was released on October 25, 2016 for $19.99. 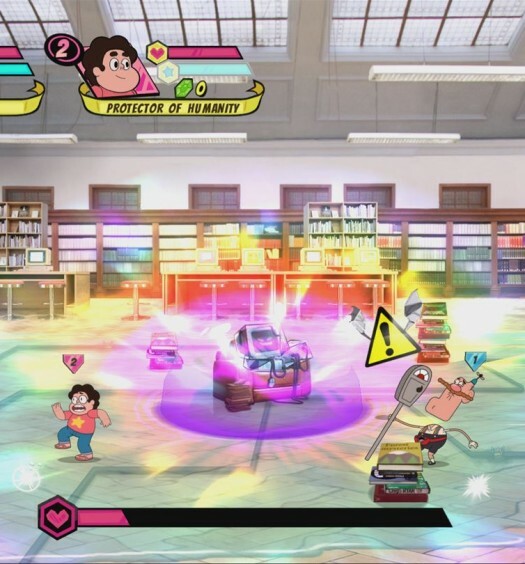 A copy of this game was provided for review purposes. Team 6 GameMill Entertainment Monster Jam: Crush It!